Sri Tumuluri Satyagopal learned mridangam from the late Sri Mahadevu Radha Krishna Raju garu and vocal from the late Sri Vankamamidi Veera Raghavaiah garu in Vijayawada, Andhra Pradhesh. He is currently learning advanced techniques in violin from Sri Mysore V Ambaprasad garu. As a musicologist , Mr. Tumuluri has researched derived ragas, blend Melakarta ragas, full-scale ragas, and a new system of Tri-sruti ragas. Some of his research was presented at the Madras Music Academy and published in the Journal of Madras Music Academy. Mr. Tumuluri’s notable compositions include the keerthana “Rama ni pada,” which uses the blended raga Hari Charukesi; a thillana in the niroshta raga Putrika. A number of his compositions, including a song in Kanakangi ragam, have been choreographed into Kuchipudi dance pieces and are being performed in India and the United States. 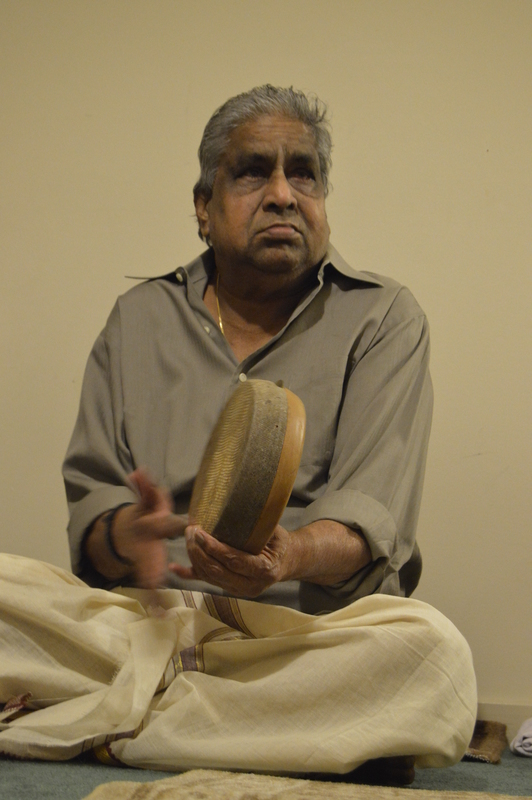 Mr. Tumuluri has been teaching and performing Carnatic music for over six decades in India, Singapore, and the United States. As part of his emphasis on fundamentals, he wrote and teaches lyrics for the basics of music—sarali swarams, janta swarams, and the alankarams, extending to the 35 talas. A compilation of his work, named “Swaranandalahari”, has been recorded and is being propogated by the renowned Parupalli School of Thought, based in Visakhapatnam. For further information on this, please go to the Sangitham (under classes) section of the site. Mr. Tumuluri has also had some notable work outside of music. He spent a large part of his life as a coal scientist, which he retired from in 1995 as the Deputy Director of the Central Fuel Research Institute in Dhanbad, Bihar.